The name Bosnia Herzegovina has been used as a regional designation, but Herzegovina has never had any precisely defined borders of its own. The region was simply called "Bosnia", until the Austro-Hungarian occupation at the end of the 19th Century. The name "Bosnia" most probably comes from the name of the Bosna River, which was referred to in the Roman Era by the name "Bossina". The earliest population of this region was known in ancient times as the Illyrians. Conflict between the Illyrians and Roman Republic began in the 3rd Century BC, during the Punic Wars, but Rome did not complete the annexation of the region until AD 9, during the reign of Emperor Augustus. During the early Roman Imperial period, Latin speaking settlers from all over the Roman Empire settled among the Illyrians, and Roman soldiers were often encouraged to retire there. By the third Century, many of the descendants of these Romanized Illyrians had joined the Roman military and had risen through the ranks to eventually become generals and even Roman Emperors! Overlapping dates from the late 3rd Century through the late 5th Century reflect the fact that at the time there were two Roman Emperors, one for the Western Empire and one for the Eastern Empire. Following the fall of the Western Roman Empire, the Illyrians were conquered by Slavic invaders. The Slavic invaders brought their tribal culture and pagan religion along with them, and today, quite a few place names have Slavic pagan origins. For example, Mt. Perun was named after the Slavic god of thunder and lightening. Eventually, the Slavic settlers and the Illyrians were all Christianized. 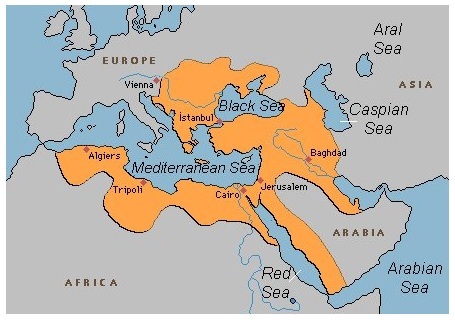 The Byzantine (Eastern Roman) Empire regained control over the region, which continued through the 10th Century. 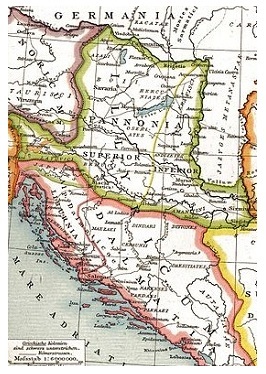 From the 10th Century, Bosnia Herzegovina was split between the Principalities of Serbia and Croatia, then they became a disputed territory between the Byzantine Empire and the Kingdom of Hungary (Huns). Finally, in the 14th Century, Bosnia became an independent Kingdom. The Kingdom of Bosnia survived until the 15th Century, when the Byzantine Empire collapsed, with the fall of Constantinople, and the Ottoman Turks began their invasion of Europe. The Ottoman Empire's annexation of Bosnia marked significant changes in the region's political and cultural landscape. Bosnia was incorporated as a province of the Ottoman Empire, and it was allowed to retain its historical name and territorial integrity, a unique case among the Turkish controlled states in the Balkans. Within Bosnia the Turks introduced a number of key changes in the territory's social and political administration, including a new landholding system, a reorganization of administrative districts, and a system of social differentiation, based on class and religious affiliation. 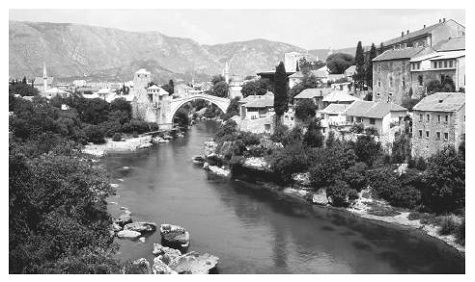 A number of cities were also established during Turkish rule, including Sarajevo and Mostar, which grew into regional centers of trade and urban culture. The three centuries of Ottoman rule also had a drastic impact on Bosnia's population make-up, which changed several times as a result of military conquests, frequent wars with European powers, forced migrations, and epidemics. A native Slavic-speaking Muslim community emerged and eventually became the largest of the religious groups. Though Christianity was protected by imperial decree, Christian worship was not encouraged, and most of the Christian churches in Bosnia Herzegovina were closed. The 18th and 19th Centuries were marked by military failures, numerous revolts within Bosnia Herzegovina, and several outbreaks of the plague. Agrarian unrest eventually sparked the Herzegovinian Rebellion, a widespread peasant uprising, in 1875. This rebellion quickly spread to several Balkan states, as well as to the European imperial powers, a situation which led to the Congress of Berlin and the Treaty of Berlin in 1878. Per the terms of the Treaty of 1878, the Austro-Hungarian Empire was awarded the military and administrative occupation of Bosnia Herzegovina. Though, technically, Bosnia was still considered a province of the Turkish Empire, it was now controlled by the imperial government in Vienna. Austro-Hungarian authorities embarked on a number of social and administrative reforms which were intended to make Bosnia and Herzegovina into a "model colony". With the aim of establishing the province as a stable political model that would dissipate rising South Slav nationalism, Austro-Hungarian rule did much to codify laws, introduce new political practices, and provide for modernization. The Austro-Hungarian Empire built the three Roman Catholic churches in Sarajevo, and these three churches are among only 20 Catholic churches that remain in the state of Bosnia. External matters began to affect the Bosnian Protectorate and its relationship with Austria-Hungary. A bloody coup occurred in Serbia, on June 10, 1903, which brought a radical anti-Austrian government into power in Belgrade. Serb attempts to foment agitation followed, advocating a unified South Slavic state, ruled from Belgrade. Also, a revolt in the Ottoman Empire in 1908 raised concerns that the Istanbul government might seek the outright return of Bosnia Herzegovina. These factors caused the Austrian-Hungarian government to seek a permanent resolution of the Bosnian question, sooner, rather than later. 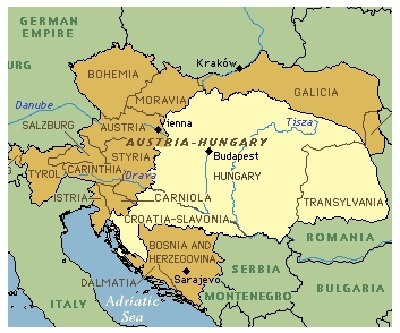 On October 6, 1908, the Austro-Hungarian Empire seized the Turkish province of Bosnia, and it officially became a province of Austria-Hungary in 1909. Political tensions got progressively worse, and on June 28, 1914, a Serb nationalist assassinated the heir to the Austro-Hungarian throne, Archduke Franz Ferdinand, in Sarajevo – the event that led to World War I. After World War I, Bosnia Herzegovina joined the Kingdom of Serbs, Croats, and Slovenes, which eventually became the Kingdom of Yugoslavia.